Can You Really Make Money Writing For Rant, Inc.? This is a website that I found while doing some research about websites that sometimes hire freelance writers. I had never heard of this one, but the landing screen intrigued me, as did the name. But the real question was this… can you really make money writing for Rant, Inc.? To start with, I am going to say this. I love the idea of freelance writing for a number of reasons—most notably because it could potentially offer me the opportunity to build a rather profitable side-hustle. In this day and age, one job just doesn’t usually cut it. And the truth is that most people I know who are doing rather well on the financial side of things are doing well because they have a side-hustle. But the problem is not the idea of starting one. The problem is finding the right one for you. I have quite a bit of experience writing, so it makes sense that I would choose a writing gig as a side-hustle. So lately, I have been going through websites that hire freelance writers in an attempt to find the best ones. But will Rant, Inc. make the cut? The Basics: What Is Rant, Inc.? Rant, Inc. says this about their website on the easily-accessible ‘About’ page. Yes, I agree that this sounds a bit generic—but it goes on to say a lot of other things that give context here. For example, they say that they deal in the areas of lifestyle, fitness, exercise, technology, entertainment, and celebrities. They apparently got their start in 2010 in Winfield, IL., when the co-founders, Brett Rosin and Grant Brown, began to build a collection of 155 sports team blogs. Over time, these blogs eventually combined into one centralized hub that, today, is known as RantSports. So that is a little bit of background on the company. Today, they staff 33 employees, and have relocated their headquarters to Irvine, California. They also maintain an ‘expansive’ writing staff, and for good reason. From the sound of it, this company needs a lot of content written! My Initial Opinion Of Rant, Inc.
My first impression of the website was actually really good. I liked the landing page banner. It was simple, elegant, and to the point. I feel like this is a company that has fully matured into a full-featured website that is both attractive and functional in the right ways… but it is also pretty popular. 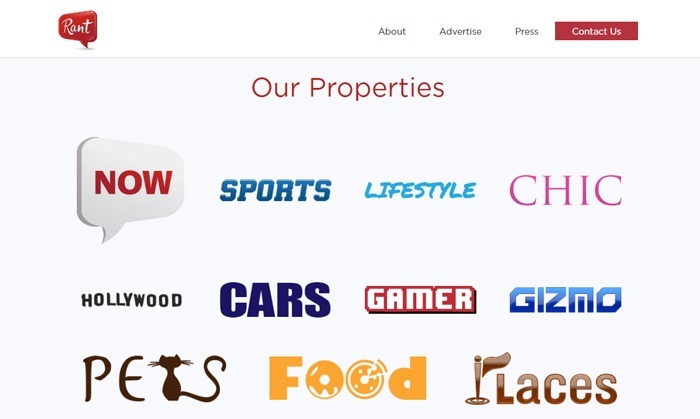 Scrolling down a bit on the landing page, you can quickly find a rather large list of ‘properties’ maintained by this company. These are basically links to applicable Rant websites. Here is a screen shot of what this page looks like. It is honestly pretty well-done. There were others located beneath this page as well. There are just so many links that they would not all fit onto one page. From the sound of it, this site, www.rant-inc.com, is the hub of the entire Rant empire. So it would seem that applying to write here would possibly give you access to opportunities writing for any number of their websites… and if this is true, it is very good news, because this site definitely has a lot of content to publish every month! In fact, the content is what I was interested in checking out next. I wanted to see if they published quality content, for a few different reasons. For one, great articles means a larger audience. But also, better articles mean that writers will have to really step up their game if they want to get published. It is also a good idea for writers to check out any content on websites that they plan to pitch to because this will give them a better idea of the style of content that those sites are looking for… which will increase the odds that the writer will be able to write something that will actually get published. But interestingly, I noticed that there wasn’t actually any content published on www.rant-inc.com. In order to find any articles published by this company, you need to go to one of their properties. So that is what I did. Here is what I discovered. The first step here was to figure out which property site I needed to visit. I needed to pick the one that I would be most-likely to want to write for, and ended up deciding on the Gamer option. So I clicked on it, and was promptly taken to www.rantgamer.com. Here is what I found on this page. As you can see based on the screen shot, most of the landing screen was banner ads. But when you scroll down, you quickly find that there are quite a few articles available to look at. I clicked on one and got to it—but quickly found out that this is one of those sites that publishes articles in ‘slideshow’ format. I do not mind this format so much when I am on a computer. But when I am trying to read on my smart phone, these types of articles are the bane of my existence. I have pretty much gotten to the point where I do not even try to read them anymore if I am not on an actual computer. But yeah. The content was not bad. The article was well-written and I enjoyed it. It was a quick read though. I was done with it (slideshow and all) within about two minutes. I then checked out another article, written by another writer. It was a news piece, and while it was interesting and well done, it literally took me about one minute to read, and was super-simple. 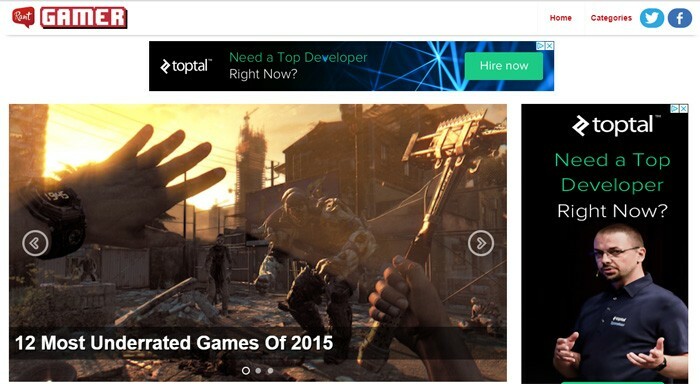 This site seems to publish content that is brief, to-the-point, and not time consuming. I guess this is good news though, seeing as how it can actually be tough to compete for reader attention nowadays online. It also made me wonder how much writers get paid for contributions. So that is what I decided to check out next. Rant currently uses over 300 paid writers located in the US and Canada, which does not surprise me—as their content needs are actually huge. Their submission guidelines are pretty simple. If you are interested in writing for them, you are supposed to write to them at the email address provided on the ‘Write For Us’ page of www.rant-inc.com, and send a resume along with at least one editorial writing sample. You must also be at least 18 years old to apply. As of the time that this was written, they said that they were only hiring writers for RantSports and RantFinance. Apparently, they change this as their need for writers changes… so it might do you well to keep an eye on this page if you are interested in contributing to one of their sites in the future. They also make it a point to say that they do NOT accept guest posts. Fair enough! They also fail to mention how much they actually pay writers… but to be super honest, this is also not something that a lot of websites openly advertise. You usually need to actually contact the company to find this information out. The Rant, Inc. company runs some pretty popular websites that post a lot of content—and while they might not always be hiring for all of their sites, I do feel like this is a good name to keep on-file to check back with. If you find out that one of their sites is hiring, and you feel like writing for one of those sites would be a good opportunity for you, then I cannot imagine how it would not be worthwhile to submit an application. You do have to include your resume, though… as well as at least one sample of something you have written. If you do not include these two things in your submission, they will not consider you! I am not sure how much they pay, but you probably won’t get rich writing for Rant. But you may be able to make some pretty sweet extra money, and you may be able to get your foot in the door for larger projects as well—and those are both things that are definitely good! 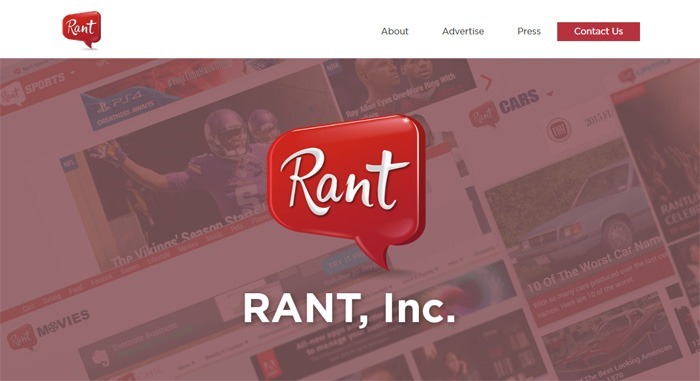 Our Final Opinion About Rant, Inc.
Should you apply and try to make money writing for them?